*Big action, small space: Keep a lot of kids happy in even a small yard with an inflatable bounce house rental or a big water slide from Jumpin Jack Splash. *Grab a camera and have them strike their best mid-air slam dunk pose. Print it off as a party favor and souvenir from the best birthday party in Utah. *Hold timed races. Hand out ring pop Championship Rings to all the participation and a small homemade trophy to the winner. If you are really crafty make it an Olympic Sized event! 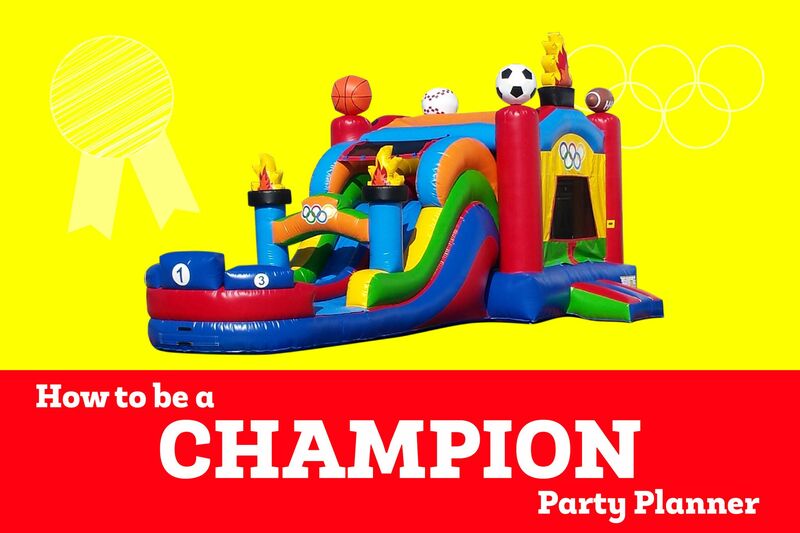 Make bronze, silver and gold medals and have the winners pose next to the podium on the Deluxe Sports Bounce House and Slide Combo! Just add water and make any sport more interesting with Water-Balloon basketball! *Serve ball-park favorites. Rent a hot dog, popcorn or sno-cone machine to please the entire crowd. For more backyard birthday party tips give one of our event specialists a call at 435-843-1500!